Kummattikali is a famous folk dance of the Southern Malabar. It is performed in association with the harvest festival Onam. 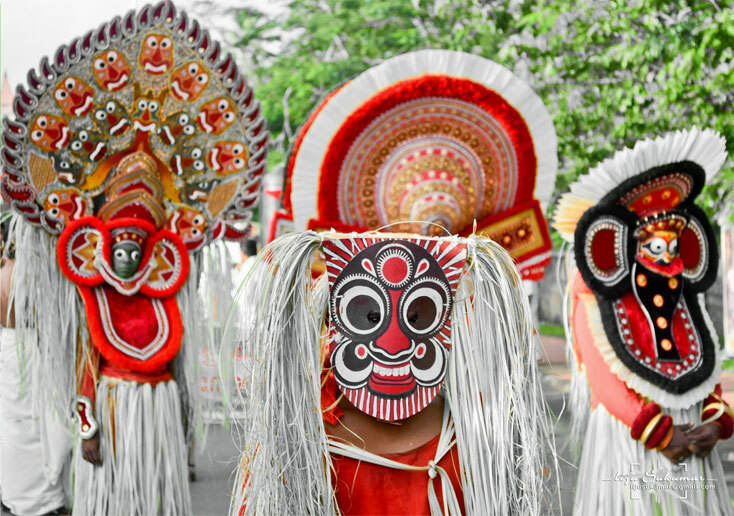 Like Onam, this dance is also colorful and it is a mask dance. The artists wear a mask made of wood from trees such as jackfruit trees and these depicts faces of Krishna, Narada, Hanuman, hunters etc. The costume consists of a skirt made of grass while some cover their whole body with grass. They also cover their body using flowers. The dance is related to the myth Shaiva and a notable character in the play is the Thalla, an old toothless woman who walks with the support of a stick. She is considered to be the mother of everything. The mask of Thalla looks like an old women, has hair tied on the head and wears a huge round ear ornament. The performance of Thalla make the audiences laugh. The theme for the dance is obtained from the epics Ramayana and other folk stories. According to the legend, this dance is the enactment of the dance performance by the Bhoothaganas of Lord Shiva. A bow like musical instrument called Onavillu is used which produces a sound when the string in it is vibrated. It is made of Arecanut wood. The songs are very melodious that have the devotional themes and is very attractive. It is sung by the leader of the group and songs of King Mahabali are famous as this dance is associated with Onam. The Kummatti players who wear masks do not sing the songs. The dancers move from one house to another and collect gifts like money, rice, cash etc. The spectators also move along with the dancers and celebrate it as they consider this as part of a cultural procession. Kummattikali belong to the category of devotional art forms. This dance is most common in the Thrissur district of Kerala and its original form can be seen from Bhadrakali temple in Palakkad district. The Kummattikali played in Thrissur starts at dawn on the Thiruvonam day. The artists visit the temple and seek blessings from the God. It is the men from the Nair community who usually perform the Kummattikali. Now people from other community are also engaged in this play. The people who perform this are not trained and are learned by participation. The number of people who participate in this vary.